I try to create environments that make the viewer feel a sense of doubt and/or a moment of confusion. Here, in two very different types of works, one an installation the other drawings, she does just that. 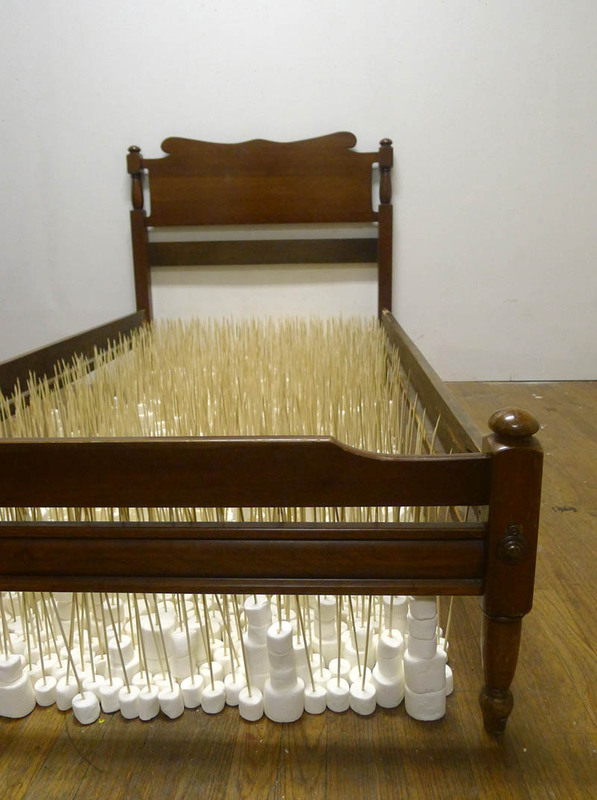 Above, her installation titled Under the Bed is made with a wooden bed frame enclosing a ‘mattress’ of skewered marshmallows. Maybe not a lot of doubt here, but definitely some confusion. Below, her ink drawings on typical architect canary-yellow tracing paper are part of a series titled NYC: An Honest Lie. Typically, people associate architectural drawings with the documentation of truth and precise representation. My work challenges this association by using the vernacular of architectural drawings to create “lies” about buildings. I will slightly misrepresent buildings by either idealizing them and/or intentionally distorting them. I aim to provoke the audience to question not only the validity of what they are seeing, but also their own perspectives towards their external environment. In addition, Smith uses varnish to mount the tracing paper drawings onto canvas, adding to the ‘lie’ by disguising them as paintings. I love all of this work. It’s smart, full of humor, plus, I’ve always found those canary-yellow rolls of tracing paper an odd choice for architects – the color, the curling aspect from being rolled – so the choice of that material alone makes me chuckle. If you look closely at the first two images below (one a detail, the other an installation view) the drawing is a detailed diagram titled 14th St./6th Ave Subway Gum Conditions Survey. Many of the other drawings are of buildings around Union Square, right here in NYC, so maybe my familiarity with the neighborhood adds to the appeal as well. 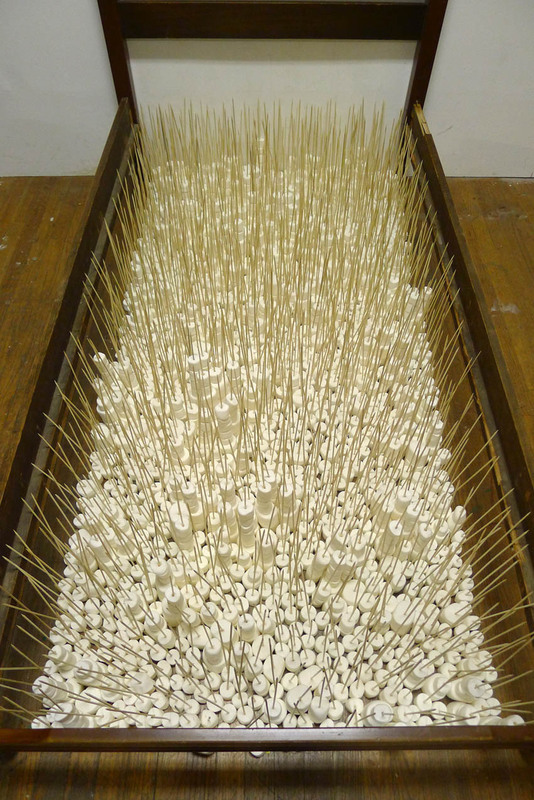 This entry was posted in Architecture, Art, Fun, NYC, Stuff We Like. Bookmark the permalink.